Now that the never-ending winter seems to make its way out, it's time to start thinking about your bikini body. But who said snacking is bad? I'll tell you how to change your unhealthy snacks to healthy snacks! Feel like eating crisps/chips? Eat some popcorn instead: less calories and apparently packed with antioxidants, who knew? I love popcorn! Feel like snacking something small? Eat some nuts: almonds, walnuts, hazelnuts, unsalted cashews.. A small handful will satisfy your snacking cravings. I like to slightly roast almonds in a big pan because it really brings out the flavour. A handful of home made granola is also yummy. Go for chocolate with 70% or higher cacao concentration. I always have a bar of Lindt 70% or 85% in my fridge. A tiny piece tastes more chocolate-y than a whole bar of milk chocolate! If you don't like dark chocolate, still give it a try. Always go for good quality dark chocolate (Lindt is my favorite) and I promise you will get used to it and even start to like it after some time. Make guacamole! Buy a few avocados at the start of the week so you can have a perfectly ripe avocado at any time during the week. My favorites are hass avocados; you know they are ripe whenever the skin is completely brown and feels a little soft. I make guacamole with one avocado, the juice from 1 lime or half a lemon, some fresh coriander leaves, salt, pepper and some chili flakes. Mash everything together and you've got the perfect creamy guacamole to eat with toast or crackers. Looking for a super healthy snack on the go? I love this snack because it's easy to pack up and take with you anywhere you go. Cut up some carrots/celery/sweet peppers and buy some hummus (Marks&Spencers have 3-packs of small hummus pots). If you have spare time, make your own (Ina Garten has an easy recipe) it's so easy and you can flavour it however you like. I like adding some olive oil, sesame and nigella seeds. Pack up your vegetable sticks in a tupperware and the hummus in a separate container and you've got the easiest, healthiest snack for on the go. Skip the ice cream and opt for frozen yoghurt instead. Just as good - or if you ask me, even better - than ice cream and less calories. My favorite is home made froyo, but otherwise Pinkberry in London is great. Another favourite of mine is Greek yogurt with strawberries, banana and granola. Who says you can't eat breakfast for dessert? Want an indulging Sunday breakfast or 4 pm snack? Banana pancakes are the discovery of the year for me in terms of breakfast. SO good, cute and healthier than pancakes/crepes. Check out my recipe here. I reckon it's also easy to pack up and take with you to work or uni. Just heat them in the microwave. Having an 11 am dip? Whip up a smoothie. If you're out the door, prepare it in the morning, pour it in a bottle and keep it refrigerated. 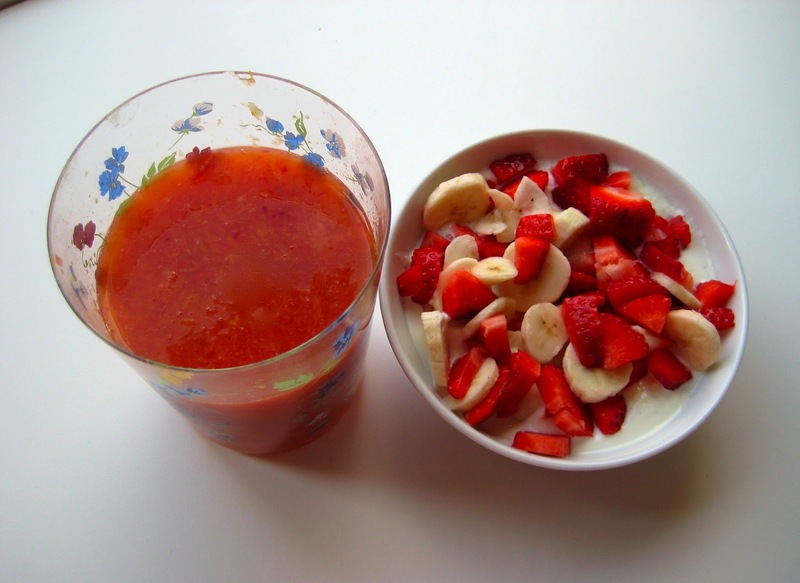 If you're at home, you've got all the time to make a delicious smoothie! I always have bananas and oranges in my fridge, and frozen raspberries in the freezer. Add spinach for an extra health kick. Now that fruits becomes cheaper and better (mm strawberries!) they become the perfect snack. A couple of juicy strawberries is better than some sweets right? Also don't forget that while you may think you need a snack, your body is just asking for water. So next time you feel like tucking into a bag of crisps, drink a glass of water first. So what are your favourite healthy snacks?